Actor Kiefer Sutherland has left jail in California after serving a 48-day sentence for drink driving. A police officer said the star - best known for TV series 24 - had spent his sentence cleaning bed sheets on laundry duty and had been "very humble". Sutherland was arrested and found to be over the legal alcohol limit after leaving a party last year. He was still on probation for a previous offence. The 41-year-old was sentenced after pleading no contest - or guilty. He was fined $510 (£250), given five years probation and was ordered to take alcohol education and counselling programmes. His sentence at Glendale city jail consisted of 30 days for driving with a blood-alcohol level above the legal limit and 18 days for violating his probation. 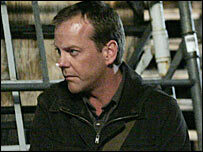 Production on the seventh season of 24, in which Sutherland plays counter-terrorist agent Jack Bauer, has been suspended because of the Hollywood writers' strike. The first episode of the season had been due to be screened in the US this month. Sutherland won an Emmy award in 2006 for his role in the real-time drama. The Canadian actor, who rose to fame in films including the 1987 teenage vampire film The Lost Boys, also starred in Flatliners, with ex-fiancee Julia Roberts, and legal drama A Few Good Men.